Born on February 12, 1948 in Liepaja, Latvia. In 1976 graduated from the Philosophical Department of Leningrad State University. On December 27, 1979 defended the PhD dissertation entitled The Critical Analysis of Social-Philosophical Views of J.Krishnamurti. On October 9, 1992 defended the Habilitation dissertation entitled The Epistemology of Late Syncretic Nyaya-Vaisheshika (Historical-Philosophical and Logical-Theoretical Research). From 1980 - researcher (from 1993 leading researcher) at the Leningrad/St.-Petersburg Branch of the Institute of Oriental Studies (now the Institute of Oriental Manuscript) of the Russian Academy of Science. 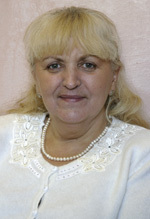 Dr E.Ostrovskaya was appointed UNESCO Professor. In her research she focusens on the history of philosophy, religions and culture of the countries of the Asian-Pacific region. On September 26, 2016, the Additional Meeting of the Seventh Dorjiev Conference will be held at the IOM RAS .